9 Repatternings are demonstrated by Chloe Wordsworth in 6 classes of 3 1/2 hours each. learn in our traditional interactive seminar experience online! access the recordings and online class space for up to 12 months. The course starts with your approved registration. Available to all membership levels; there are no pre-requisites. LIVING IN TUNE WITH YOUR LIFE is the third in the Living in Tune series. Once more we invite the whole community of Resonance Repatterning practitioners, clients, friends, family and anyone else who is interested in experiencing Resonance Repatterning with the author and founder of this work. And it is a joy connecting with RR practitioners from around the world -- we really are a global community! 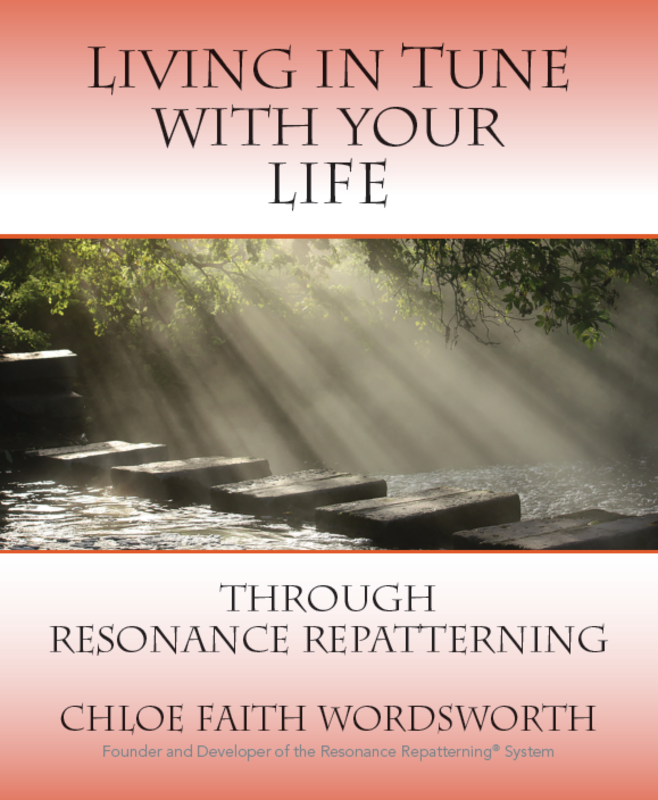 In six 3 1/2 hour sessions Chloe will demonstrate the Repatternings from her powerful new book -- all updated and transformed from the original Living in Tune web radio show of eight years ago. Chloe and the organizers have decided to offer this special Living in Tune series at a discounted price of $300 so everyone can afford to attend -- either online, or by audio during or after the live sessions. Each chapter relates to different facets of what it means to live in tune with our life, offering inspiring true stories, fascinating information plus Repatterning processes that help us apply the information and stories in our everyday lives. Chapter 1: The Marriage of Yin and Yang. The union of yin (soul) and yang (mind) represents the innate impulse of our mind to access and live the positive qualities associated with our soul and to realize higher states of consciousness through love. Chapter 2: True Aliveness is about resonating with the five essentials for living the unconflicted life. At a time when the third cause of death in children is suicide, the stories in this chapter offer a different possibility to each one of us when facing despair or when challenged to go into unconflicted action. Chapter 3: Our Resonant Note is about tuning in to our personal sound or note that calms the mind and helps us through life’s transitions. Inspirational stories illustrate how we can use our resonant notes. Chapter 4: Our Resonant Breath is about regaining our health through balance: oxygen and carbon dioxide balance, potassium-sodium balance, nervous system balance and acid-alkaline balance. We see how hundreds of illnesses relate to improper breathing and learn a particular way of breathing to correct these imbalances. Chapter 5: Thinking in Curves is about using our goals as a stimulus that leads to wholeness and heightened awareness. Very different from straight-line A-to-Z goal setting, which is about ‘getting’ something and being fixed on a particular outcome. Chapter 6: Beliefs and Perception of Time. In this chapter we learn about the discontinuous moment talked about in physics when the seemingly impossible becomes possible – and about the people who have broken the myth of time and made the impossible possible. Chapter 7: Outer Image Aligned to Inner Nature. Our outer self is meant to mirror the beauty of our inner nature. How we see our outer self either limits the expression of our essence or helps us express what the ancient Chinese called our original nature – the essence of who we truly are. Chapter 8: Our Resonant Weight introduces seven out-of-the-ordinary ways that relate to overweight: our fight-flight responses; conflicts and non-truths; the Five Elements of Chinese Acupuncture; the five archetypes of the Innocent Child, the Helper, the Wanderer, the Warrior and the Wise One; excess loss of carbon dioxide; cold showers; and the scientific and physical aspect of weight. Chapter 9: The Hero’s Journey looks at the five characteristics associated with the hero that we see in myths, stories and movies. We see how these characteristics and the five archetypes relate to the seven journeys we have the potential to make in this life. The spiral-bound version: mostly for Resonance Repatterning practitioners who need to bend the book back when doing sessions. The paperback version: mostly for those who want to read the book. Come join us for 6 once weekly 3.5 hour sessions where you get to experience these powerful Repatternings – proxying in to the session someone volunteers to have or experiencing the power of these Repatternings yourself – as the Founder of Resonance Repatterning, Chloe Wordsworth demonstrates each one.